My son recently started playing soccer. So, every Saturday morning I like to make a nice hearty breakfast before his games. We’ve been doing alot of pancakes, omelets and oatmeal, and now waffles. That’s why I like to use a blender to quickly whip this batter up. It makes for a fluffy gluten and grain free treat. These also freeze well, so I recommend making a double batch. Place all ingredients in a food processor or blender, except the vinegar. Blend on high for 1 minute. Add vinegar and blend another 30 seconds. Follow instructions for your waffle maker using the batter. Serve waffles warm with some easy caramel and toasted pecans. 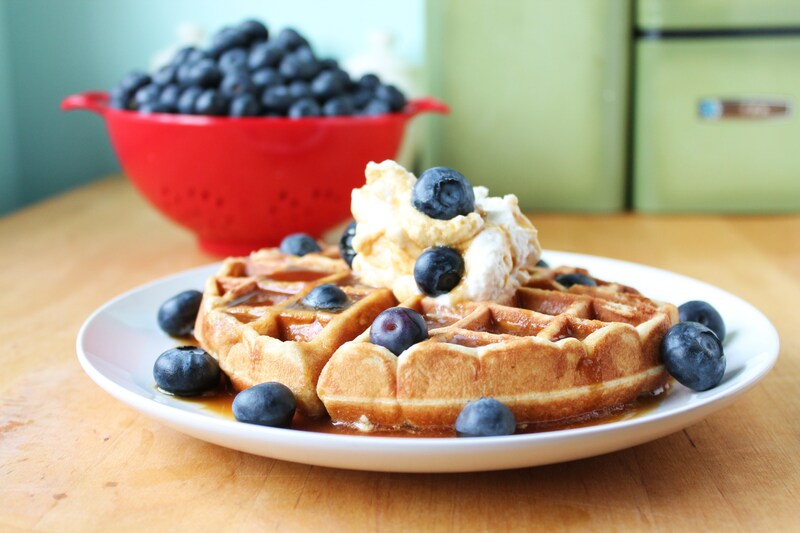 These waffles are GREAT, and a good freezer recipe. Yesterday morning I made apple butter, and then mixed equal parts of apple butter and marscarpone cheese. Then topped the waffles with this delicious concoction. YUM! My new breakfast favorite. I just discovered your site and am loving the recipes that are grain free but low maintenance ingredient-wise. No gums, no sugar substitutes. These waffles are coming out of my waffle maker now and they are great! I will become a frequent visitor for sure. There are no allergies in our family but I am trying to reduce the wheat intake, so if I can find lovely creations like these that aren’t “poor cousins” to the typical recipes, I am a happy mama. Thank you! It’s great to have you here! Yes, I like to keep things simple :) Thanks for the sweet comment. Please come back. these look great! 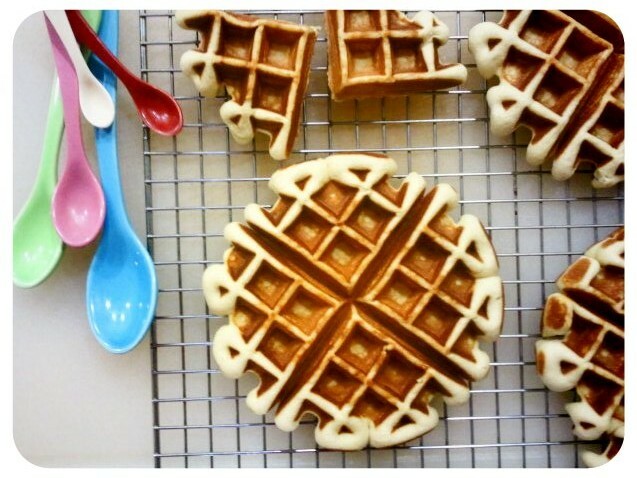 they look so much fluffier than i would expect a gluten/grain free waffle to be! can’t wait to try them! These look great! what waffle iron do you use? Hi! So happy to have found this recipe – I’ve been looking for a gluten free waffle recipe that specifically uses almond and/or coconut flour! Just one question – the oil is nonspecific so I’m assuming coconut oil is ok to use?? Thanks for these awesome recipes – love your site! I use coconut oil or melted butter if I’m out! Both work great. Good to have you here! Made these for my son and he loved them! finally another breakfast food other than cereal that he will eat! thanks! oh and they freeze and reheat well! These are the best (and only) nut flour waffles I have made. I thought they would be good since your pancake recipe is the BEST! Thank you!! We are waffle lovers and are newly trying to incorporate a new eating style. I was happy to find your grain-free recipe and tried it this morning. They were very good! I was afraid they would not fill us up since they are much lighter than our usual whole-grain waffles. However, both my husband and I were satisfied after we had eaten 1 1/2 of the very light, flavorful waffles with butter and pure maple syrup. Thanks so much for this recipe and for your website. In browsing, I have found lots of recipes that I want to try. Will try to let you know how we find them to be. Best wishes. I made this recipe for the second time today (with the addition of some leftover sweet potato/turnip puree). They were YUMMY!!! Wow! Just found your website and made these waffles. They were great! I am new to eating this way. Just curious… why the apple cider vinegar? I did not even taste it. What does it do in the recipe? My wife loves me even more thanks to this awesome recipe!